There’s a big party going down in Chicago today, and everyone is invited. The city is honoring and celebrating the World Series Champion Chicago Cubs with a rally and parade this afternoon, and it’s already a complete madhouse, with hundreds of fans lining up hours before the gates even opened, just to be the first to catch of glimpse of the historic baseball team. This is the team’s first championship in 108 years, the longest drought of any professional American sports team, so fans are especially eager to celebrate the victory and cheer on their hometown heroes in front of the city’s skyline. The Cubs are scheduled to begin their parade at 10am CT, leaving Wrigley Field, where they’ll march their way south toward the city’s center for a rally at noon. The rally itself will take place at Lower Hutchinson Field in Grant Park, where the motorcade is scheduled to arrive at noon. The event is free and open to the public, and all attendees must pass through security screenings at the entrance. 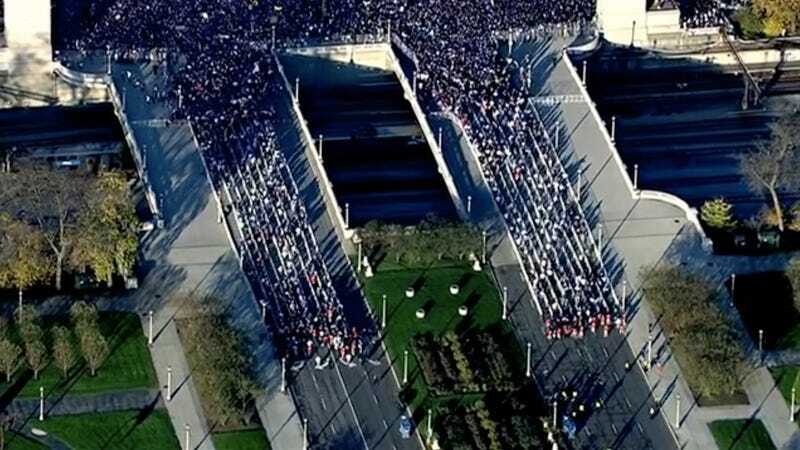 Although the rally is hours away from starting, aerial footage provided by NBC Chicago shows thousands of fans lined up at the gate, sprinting toward the stage where the rally will be taking place. It’s completely bonkers, but when you consider they’ve waited this long to celebrate a championship, the enthusiasm seems completely justified.